This is a relatively easy recipe for ‘Oreo’ cookie lovers. These cookies are delicious and look amazing! This is a ‘must-try’ recipe. 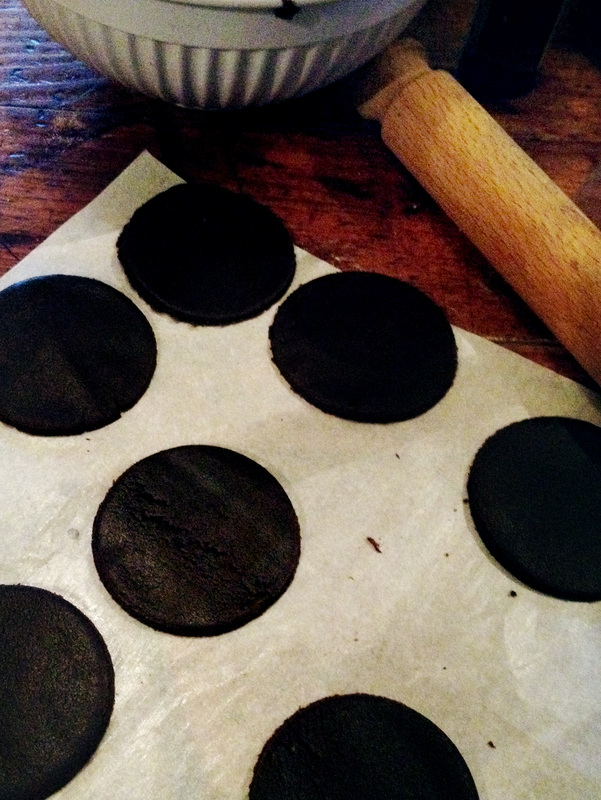 My kids love these home-made ‘Oreos’. A real treat! Last saturday I dedicated a whole afternoon trying out various ‘Oreo’ recipes and decided make two types of filling to taste. All the american recipes include ingredients that I can’t find here in Médoc, so I came up with my own versions and they taste great. The vanilla cream is close to the real thing, and the white chocolate cream is very special. So it’s up to you to decide which one you want to try. Try both! For the cookies dough: Mix all the ingredients together until you get a good batter that you can easily roll with a rolling-pin. If the colour is not dark enough to your liking, add a bit more cocoa powder until you achieve the ‘Oreo’ dark brown colour. On a slightly floured parchment paper surface, roll out the cookie dough to 5 millimeters thickness and cut out perfectly round shape either with a round cookie cutter or, like I did, a wine glass 5-6 cm diameter). Should you prefer smaller cookies, find a 4-5 cm diameter glass or cookie cutter. Bake on parchment covered baking tray for 9 minutes in you like them not too hard, 11 minutes if you like them crispy. When ready cool on a wire cookie rack. For filling recipe number 1) Combine the butter, icing sugar and vanilla essence to form a uniform smooth dough, like play-dough. Don’t hesitate to add icing sugar to get the desired texture. For recipe filling recipe 2) In a saucepan melt the white chocolate. Add the cream and heat on a low fire for 3 minutes. Stir well and leave to cool. Once cooled, add the icing sugar gradually until you get the desired texture. 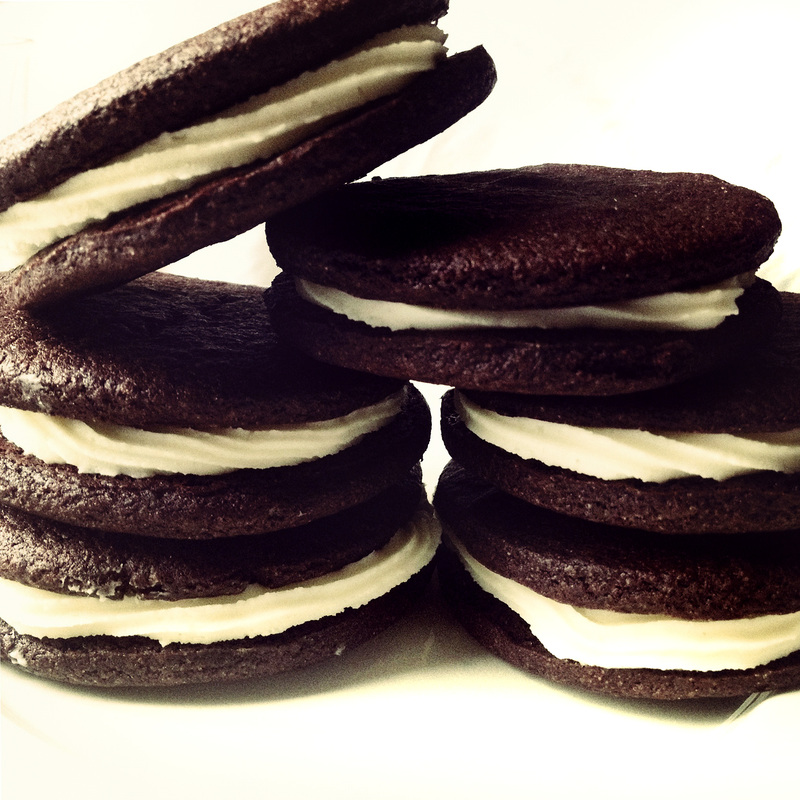 When the cookies are cool, spoon the cream filling and make your ‘Oreo’ cookie sandwich. I put the cream in a pastry bag with a standard tip and piped the filling to make it look nicer. It’s great fun to make and the kids can assist you in making their dream cookies. ps: My kids suggested that next time we make this, we should add food colouring to the cream filling so we can make multi-coloured ‘Oreo’ cookies! I like that idea!